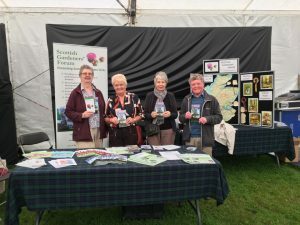 The SGF stand attracted a lot of interest, especially the Tree Trail and other leaflets from the Friends of Barnhill Rock Garden. The Friends are one of the 95 clubs belonging to SGF, and they helped man the stand for all of Friday 1st September. Jim McColl the Hon President dropped by (and thankfully into a chair).